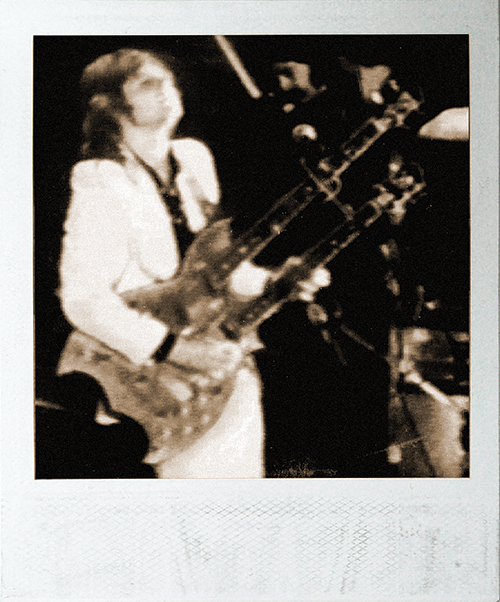 With progressive-rock juggernaut Emerson, Lake & Palmer, bassist/vocalist Greg Lake (1947-2016) played more than one instrument made by the renowned British luthier Tony Zemaitis. Photo: Ward Meeker/Doug Yellow Bird. Instrument courtesy Phil Winfield. 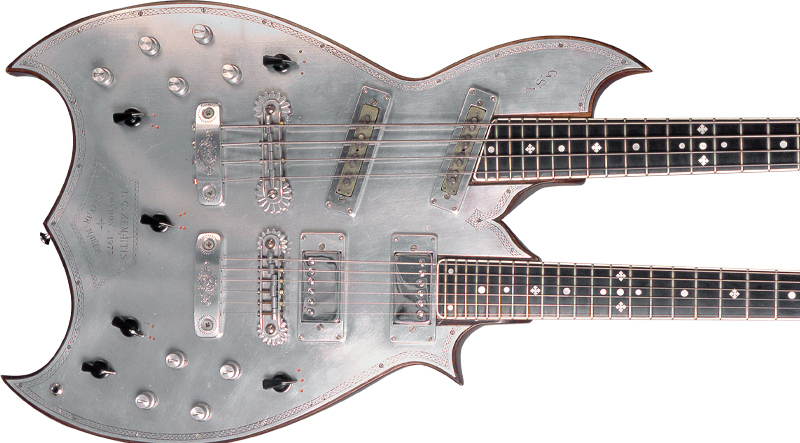 Known for their fancy tops of pearl or exquisitely engraved metal, Zemaitis instruments were truly handcrafted works of art, and the list of players who ordered them reads like the ultimate “Who’s Who” in the pantheon of rock music – Hendrix, Richards, Harrison, and more. The brand gained huge exposure in the early ’70s, when two members of the Faces – guitarist Ron Wood and bassist Ronnie Lane – played metal-fronts with the personalized/one-of-a-kind engraving that were part of their mojo. But for as unique as Zemaitis axes are, few match this one designed by Lake and believed to be one of only two doublenecks made by Zemaitis. Its body and necks are mahogany, fretboards are ebony, and headstock overlays are rosewood. The guitar neck has a scale measuring 255⁄8" (bass is 32″) and almost 24 frets – the fretboard is cut at an angle across what would be the 24th fret – and the position markers include the cluster of snowflakes at the 12th fret. The metal top is made of an aircraft alloy called Dural, set apart here from other Zemaitis instruments by the fact it has been inlaid, rather than installed as a cap on the body, leaving a wooden bezel/edge around its perimeter. The headstocks have the hallmark diamond-shaped/engraved “Z” logo plate and truss rod cover engraved with “Custom.” Engraving on the rest of the body isn’t as intricate as other Zemaitis instruments; it includes Lake’s initials (GSL) on the front and “Designed by G.S. Lake” on the Dural plate that covers much of its back. In 1981, Lake used a marker to autograph the rear plate. The pickups were made by the late British builder John Birch, with actives on the bass. And while there’s a high tally of switches and knobs, their operation is straightforward; the “chickenhead” knobs on each side of the bridges are three-position pickup selectors. The knobs behind the pickup selectors are Volume and Tone for each pickup. There’s a master Volume for each side, with that for the bass being a round knob, the guitar’s a chickenhead. Each also has a coil-tap, and the chickenhead knob in the center (below the engraved tail pieces) engages one neck or the other. Weighing an impressive 17.2 pounds, it has earned the title “heavy,” whether in a literal sense or in figurative reference to the bombastic music it helped make with Emerson, Lake & Palmer. Following the tradition of star guitars that develop a daedal history is lore about how this one apparently used to top the scales a pound heavier. The story goes that Tony Z. tried to dissuade Lake from ordering it, saying it would be too heavy. Lake insisted, however, then later decided Zemaitis was right and had portions “trimmed” by another luthier. After learning of the alteration, Zemaitis never spoke to Lake again. When asked about it in 2006, Lake did not confirm or deny the events, but said he never had a problem with Tony. Another tale says it was further routed under its top, but its present owner says the cavity has not been altered. This exquisite instrument epitomizes the tools utilized by rock stars at the pinnacle of success, and how they design axes to their specs. Impressive music is often created by impressive instruments.